What is going on with my font today? Is it all messed up when you see it or is it just on my computer? Sometimes I have to wonder - what is going on? I wanted to get this recipe posted before it gets too warm outside? Or, is it already too warm? One day it is snowing and the next day it is warm and sunny. Again, I have to wonder - what is going on? Ha Ha. I have had this recipe saved forever. It sounded good and different, but I wasn't sure how you eat it? It is not a soup, but it has a creamy sauce? Do I eat it with a spoon as if it were a soup or do I rip apart the bread bowl and spoon the sauce on top? That was my dilema, but I decided what the heck, I'm just going to make it and see how it goes. Mel over at Mel's Kitchen Cafe says this dish will knock your socks off and that it is beyond delicious. Well, It didn't knock my socks off, but it was good. I only had one little issue and it was the yellow mustard. Next time, I will either omit the yellow mustard or use a little less. Maybe a dijon would be better? Jake sure liked it and he kept telling me how good it was. By the way, I did kind of eat it like a soup and ripped apart the bowl as I went - The bottom of the bowl is the best part! Preheat oven to 400 degrees. In a large skillet, melt the butter over medium heat. Add the chicken and saute until the chicken begins to brown, but isn't cooked all the way through, about 3-4 minutes. Stir in the onions and garlic and cook, stirring often, until softened, about 2 minutes. Sprinkle the flour over the chicken/onion mixture and stir to incorporate. Cook, stirring constantly, for one minute. Gradually add the chicken broth and apple juice, stirring constantly to avoid any clumps from forming. Stir in the cream, Parmesan cheese, mustard and thyme. Simmer for about 5-6 minutes or until the mixture is thickened and bubbly. Stir in the ham and broccoli; season with salt and cayenne pepper to taste. Remove from heat. Hollow out the inside of the bread bowls by cutting off the tops and tearing out the insides. I like to leave about 1/4-inch edge along all sides of the bread bowl. Compress the remaining bread together to firm up the sides and make room for the filling. Place the bread bowls on a baking sheet and toast them for about 5 minutes in the preheated oven. Remove the toasted loaves from the oven and using a slotted spoon, divide chicken mixture evenly between loaves, reserving about 1-2 cups sauce in the pan for serving. Top the chicken mixture in each loaf with shredded Swiss and a spirinkle of Parmesan cheese. 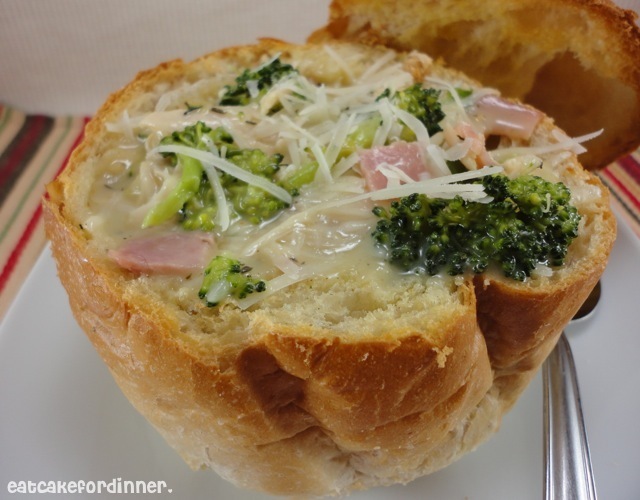 Bake the bread bowls until the cheese melts, about 10 minutes. Serve each bread bowl with reserved cream sauce. Jenn's Notes: I made a half a batch. I didn't add the apple juice, I used milk instead of heavy cream and I used the whole can of chicken broth. So, I ended up with more of a thin and brothy sauce, than a thick and creamy sauce. Next time, I will omit the yellow mustard. These look so yummy! 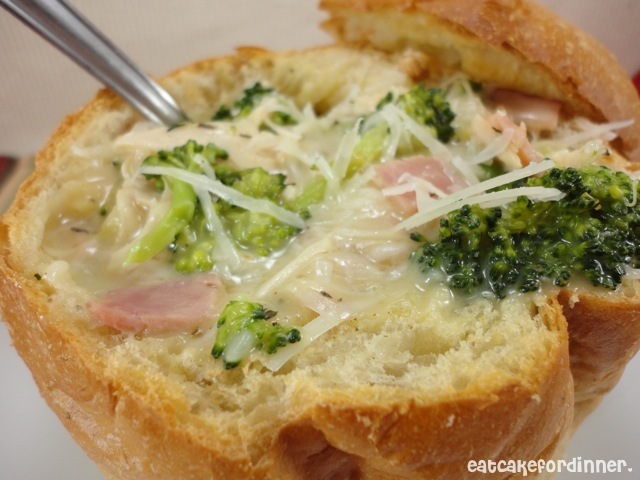 I love chicken cordon bleu and I love bread bowls--how brilliant to combine them! oh these are right up my family's alley. I'm pinning it! Wow, it doesn't get much better than this! Sounds perfect for a cold day. That looks good...and I think my kids would really like it. That looks so good & I think I'm like you with omitting the mustard. Your cheesy chili mac looks delcious, too!! Oh my goodness, this looks amazing! I love cordon bleu, but I've never seen it done like this. Wonderful! Wow, this looks so good! Browsing through your recipes- you have tons of great ones! Looks terrific. Thanks for sharing. I want dinner now.